just another stair climb video, thought you may like a look! What's the dimension of the stair ? servoes running at 5 volts from a regulator. The signal from the cpu board is at 5 volts so needs no modding. Last edited by GEMINI on Sat Nov 14, 2009 2:40 pm, edited 1 time in total. how long did it take you to perfect this ? do you use a gyro or other sensors to aid in stability? what's that mod you did with the numbers on the chest? is there a camera on the head ? The base set of moves for a single step just over an hour, then i mirrored them and set up the loop (another hour or so) then was refinement, about an hour on and off tweeking here and there. All in 3-4 hours! It does use gyro's set up as in the manual, for front to back and left to right stability. The numbers in the chest plate are from a lipo battery monitor, it shows each cell voltage then the combined voltage for the pack. And it looks good too. The head does not have a camera, just some old heat sinks cut to shape for a fuller looking head as it did look a little small. Beautiful! The motion works so smoothly! May I ask which LiPo and monitor you are using and where you got them? 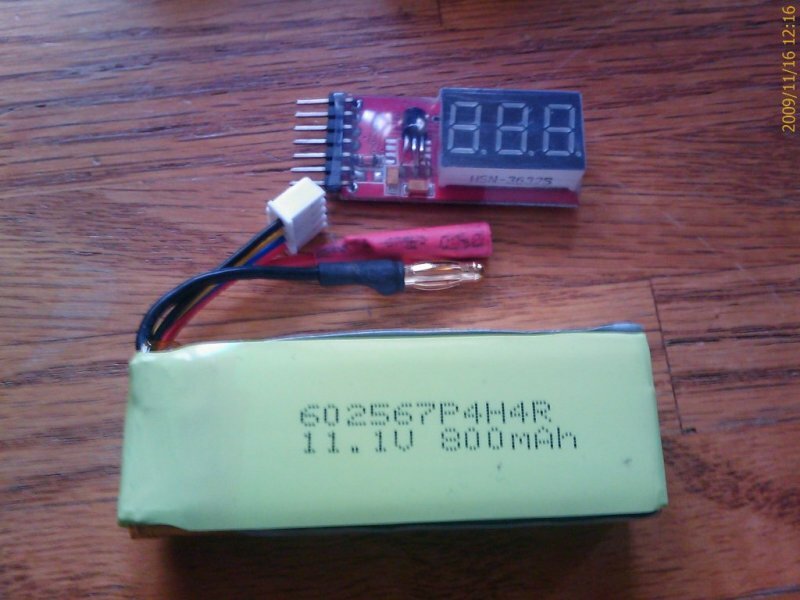 The LiPo is for a helicopter called the Twister Skylift, 3 cell 800 ma. It fits in the chest plate perfectly! The LiPo monitor i bought from a local model shop, i dont know the name as i do not have the package. Here is a pic of them if it helps. Last edited by GEMINI on Tue Nov 17, 2009 1:14 pm, edited 1 time in total. Your Hitec servos don't have a "free mode" do they? So if they are powered up they always try to hold a position, right? Are you getting the 5v from the sensor port of the RCB? NEVER use the RCB 5 volts for anything other than sensors, as the current output is too low to run servos, in the event of a stall on the servo it could damage the onboard regulator. I use an L78S05 2 AMP Positive voltage regulator, very stable needs no other components like cap's for ripple as its running from a pure dc supply. I use this to run a standard futaba servo for the head (burned a leg motor out!) as i used the head servo for the leg. I also use the same regulator for the 2 gripper servos, i have a small heatsink but it does not get warm. In free mode the servos stay powered but with no signal they can be moved, but there is no way to read there position so i turn off the free mode on these servos. Dont know why you had problems with the regulators you used or why they should overheat, unless they were only 100 or 200 ma regulators? Anyway hope this helps and if you would like a scimatic of the regulator board i used let me know, its a very simple board. if anybody needs hobby items like the voltage monitor shown above or lipos/battery packs I run a Hobby Shop in Canada and can ship worldwide. Thanks Shane, when It comes time to build my grippers I'll check out that specific regulator. Btw, I was using 2 amp regulators (don't have the part # on me), but 6v. My problem was probably connected to using cheap regulators or cheap mini servos.